Below is the information for our November and December 2014 meetings. We hope you will join us, and bring a friend! Note: There will be no Denver meeting in December. Note: There will be no Boulder meeting in November. Announcing a new book by Dr. Graeme MacQueen: The 2001 Anthrax Deception: The Case for a Domestic Conspiracy. The anthrax attacks followed close on the heels of 9/11, significantly contributing to the climate of fear and aggression escalating in the U.S.
American Anthrax, a new film by Robbie Martin, co-host of Media Roots Radio, tells us the nutshell version of the story of the anthrax attacks on America: In spite of the U.S. government’s knowledge that the source of the weaponized anthrax strain that was sent to U.S. congressmen and media outlets was manufactured by the U.S. military, the Bush administration’s initial talking point linked this “second wave of terrorism” to al-Qaeda. When that outlived its usefulness, the blame was laid on Saddam Hussein and his mythological biological weapons program, which culminated in Colin Powell’s infamous 2003 “weapons of mass destruction” speech at the UN. Anthrax War, by filmmakers Bob Coen and Eric Nadler in 2009, picks up where the mainstream media abruptly ended its investigation to report on the murky territory of the bio-weapons world. This acclaimed film was co-produced by the Canadian Broadcasting Corporation and ARTE-France. Broadcast internationally, it was nominated for the 2009 “Prix Europa” for Outstanding Current Affairs Broadcast. the massive and unprecedented privatized proliferation of anthrax and bio-weapons research and development since 2001, leaving governments less liable for accountability. 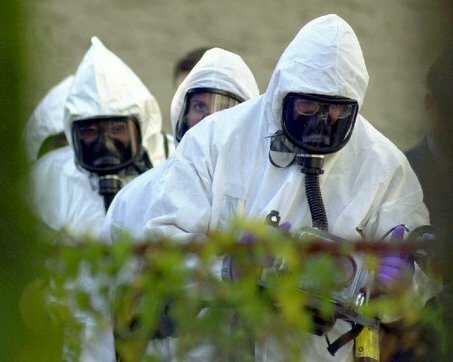 Francis Boyle, international law professor, reports that the signs are clear that the U.S. is planning to use biological weapons offensively. He warns that the human race is at a critical point, that it is up to you and to me to bring these “death sciences” under control, or our children could suffer a biological catastrophe. The two filmmakers of Anthrax War have also authored a book on the subject: Dead Silence. Truth is a powerful disinfectant. We invite you to join us as we open this dark world to some sunshine. Mark your calendars! Colorado 9/11 Truth Video and Action Meetings are held on the 3rd Friday of each month in Denver. Mark your calendars! Colorado 9/11 Truth Video and Action Meetings are held on the 4th Wednesday of each month in Boulder. Anthrax, Graeme MacQueen, Monthly Meetings, Movies/DVDs. permalink.